St Mary's chapel is attached to Radford abbey. This is one of two views of Radford in the King's Topographical Collection sold by I. Chapman. 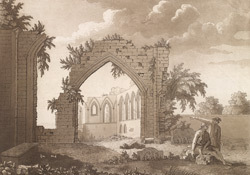 The abbey was founded in 1120 by William de Lovetot for the Augustinian order. White's Directory of 1853 reported: "The most splendid of antique architecture is the ruinous Chapel of St Mary, at the south-west corner, the windows of which are still in good preservation, and are perhaps the most perfect model of the lancet shape now remaining in England."